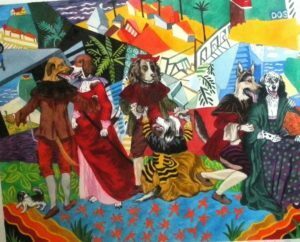 DOG COSTUME PARTY, watercolor on paper, 16" x 20"
Mannerist painting using dogs to symbolize romance and love. The Dog Costume Partyis Mannerist as the artist would refer to. It uses dogs as symbols of people and incorporates a David Hockney piece in the background. It shows loving couples enjoying themselves with their partners.